Loaded baked potato skins are a party classic, but you can take them up a notch by adding some crispy prosciutto. Whether you’re celebrating the holidays, the weekend game, or simply a weeknight get-together, these are sure to be a hit. They’re baked to perfection, topped with crispy prosciutto and rosemary caramelized onions, which means there’s nothing not to like. Serve them as an alternative to your normal side of baked potatoes to give them a little punch. Preheat oven to 425°F. Bake potatoes until tender, about 1 hour. Meanwhile, heat large skillet over medium-high heat and cook prosciutto until crispy; set aside. In same skillet, melt butter over medium heat and cook onions and rosemary until onions are caramelized, about 10 minutes, stirring occasionally. Reserve 2 tablespoons of the crispy prosciutto. Stir remaining crispy prosciutto into onion mixture. Slice potatoes in half horizontally and fluff with a fork. Top with onion mixture, sour cream, remaining crispy prosciutto and scallion. Season with kosher salt and freshly cracked black pepper to taste. 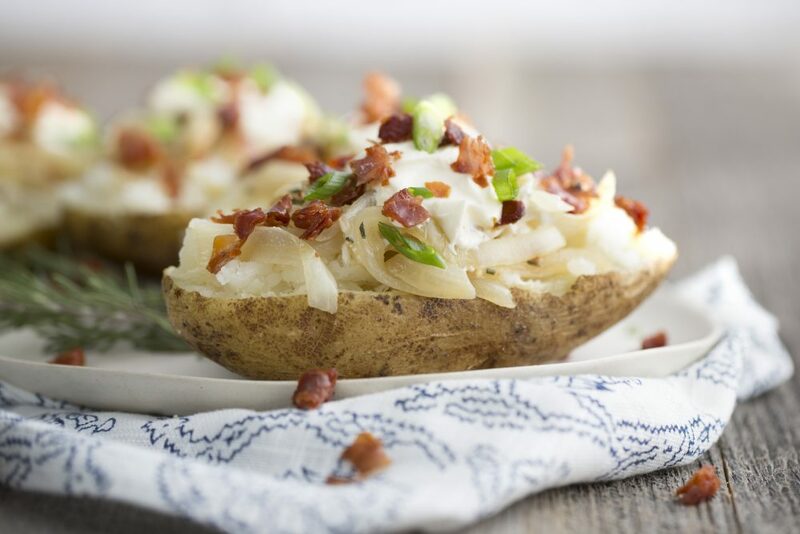 TIP: Serve as a side dish baked potato! Prepare recipe to Step 3. Then slice each potato in center, but not all the way through, and fluff with a fork. Continue with Steps 5 & 6.